Indian High Commissioner in Dhaka Harsh Vardhan Shringla today made a farewell call on President M Abdul Hamid at Bangabhaban in the capital on Thursday afternoon. During the meeting, President Hamid said bilateral relations between Bangladesh and India are very excellent and the relations have been expanding gradually, said President’s Press Secretary Md Joynal Abedin. Thanking the envoy for successful completion of his tenure in Bangladesh, the President said, the connectivity of people between Bangladesh and India has been increased. “Trade and investment have also been increased among the two countries. 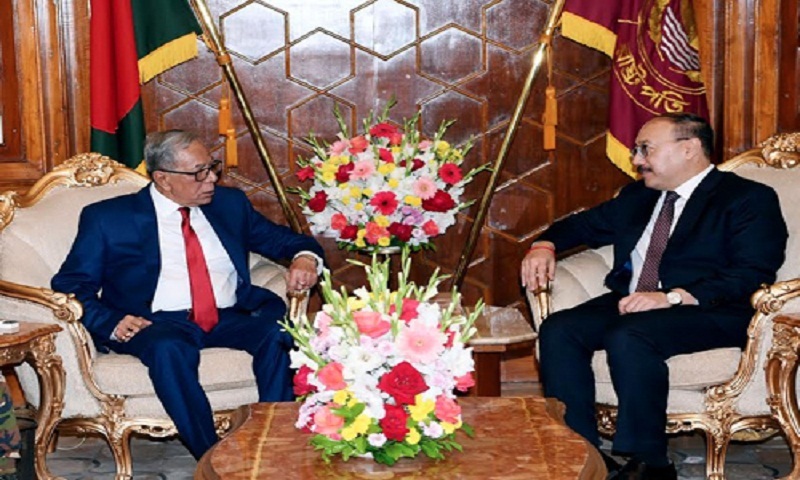 The existing relations have now reached new height during his assignment here,” President Hamid said. The President stressed utilizing comparative advantages between the two friendly countries to boost commerce and investment relations in days to come. Expressing his gratitude to the President and the Bangladesh government for their heartfelt cooperation, Shringla said India is always keen to enhance the bilateral relations with Bangladesh. Secretaries concerned to the President’s office and high officials of foreign ministry and Indian embassy were present on the occasion.